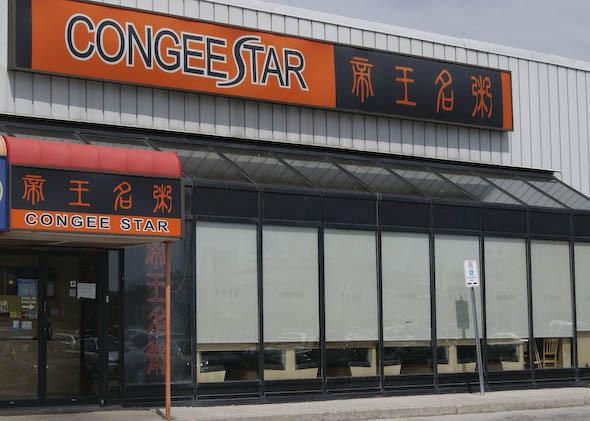 Congee Star is located in a plaza in the Don Mills and Eglinton area serving a continuous stream of customers from surrounding businesses and residences alike. Although their name highlights congee, it's only one of many types of offerings that this self-titled "authentic pan-Asian restaurant" offers. The congee selection is extensive with 27 options to choose from including the Shredded Chicken and Duck Congee ($4.95), pictured at top. The succulent duck slices are fully deboned and come complete with roasted skin. The Lean Pork with Preserved Egg and Salted Egg Congee ($4.95) includes a rough dice of both in the mix. Be warned, the salted egg is aptly named and works well with the savouriness of the black preserved egg. Those looking for something more wholesome might want to try the Taro and Corn Congee ($4.25). And for the adventurous, there's Blood Jello Congee ($4.25) which includes soft cubes of pork blood, also strangely known as blood tofu. 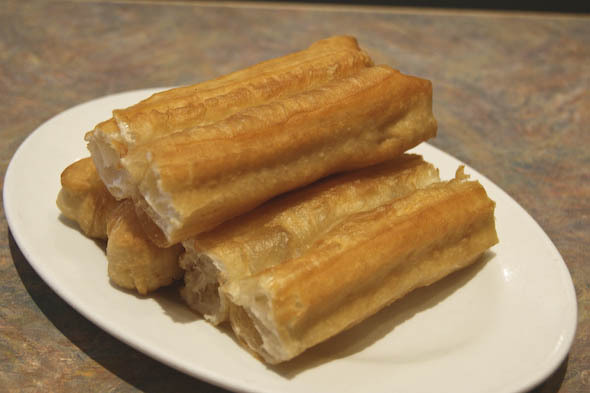 A traditional accompaniment for congee is the Deep Fried Dough Fritter ($1.50), similar to a cruller in its airiness. You dip the dough fritters into the congee as you would a cookie into milk. As good as they are in congee, I have also seen them dipped into wonton soup for a variation. Rice Noodle Rolls and Snacks are also on the menu. The snacks are akin to the options found at a dim sum place without the more familiar varieties like har gow (shrimp dumplings). 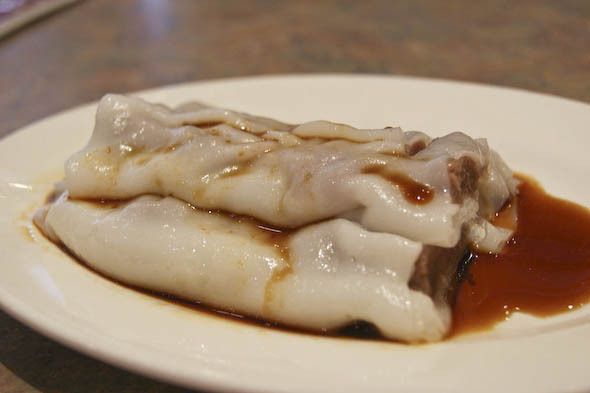 I really enjoy the Minced Beef Rice Noodle Roll ($2.95). The rice noodle delicately wraps the tender beef without being sticky and the combination of sweet to salt in the soy dressing is the perfect topping. I also try the Deep Fried Fish Skin ($3.25) which is surprisingly not greasy. The fried skin is served with a wonton soup broth for dipping which brings out the fish oil enhancing the flavour. Admittedly, fish skin is not for everyone. Just as popular it seems, is the wide selection of stir-fried noodle and fried rice dishes, so many, in fact, that it's tough to try them all. The standards, such as Cantonese Chow Mein ($9.75) or Fried Rice Noodle with Beef and Black Bean Sauce ($7.25) are solid but I'm a particular fan of the Pickled Cabbage and Shredded Pork Braised Vermicelli ($7.95), pictured above. It's light, not oily and flecked with shreds of salty cabbage and shiitake mushrooms. 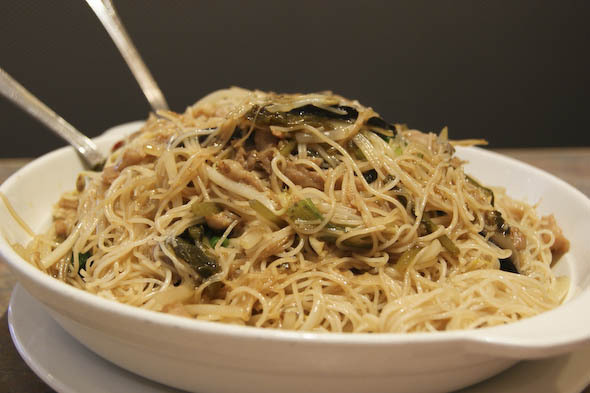 The thinly sliced pork is not overly fatty and provides the right amount of meatiness to the lighter rice noodles. I like it topped with a drizzle of chilli oil that's at each table. There are a number of dishes that are vegetable based. I hesitate to say vegetarian because I can't confirm if the sauces are made without chicken stock, oyster sauce or other flavour enhancers, such as conpoy (dried seafood usually a scallop muscle), that would not be considered meat-free. 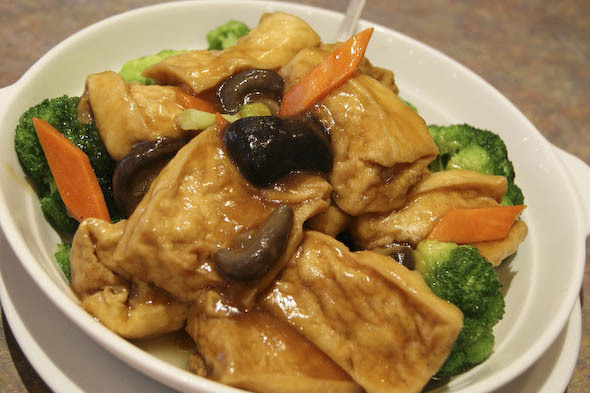 The Fried Bean Curd with Vegetable ($8.50) is colourful, fresh and sauced to well. The dish comes with just-cooked broccoli that's retained its crispness. Along with braised Chinese mushrooms and thinly sliced carrots, this is a well orchestrated dish and a good example of what Cantonese stir fry should be like. 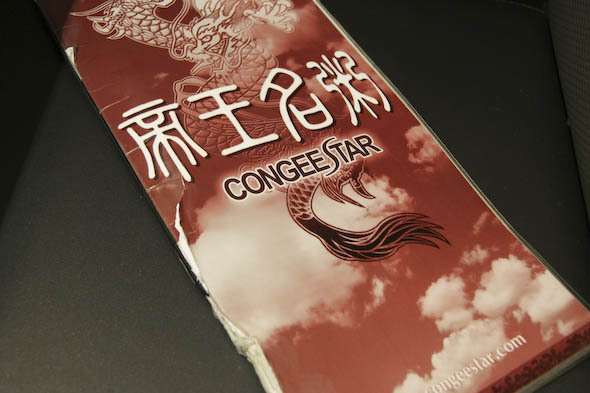 With efficient attention and speedy kitchen service, Congee Star deservedly has its loyal customers. If you're in the area, stop in at Congee Star. The hardest part will be choosing only a handful of plates from the hundreds that are on the menu.